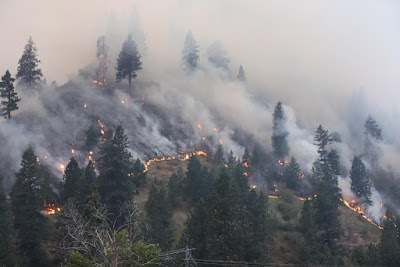 Kamiah, Idaho (July 23, 2018) – The Rattlesnake Creek fire, located on the west side of highway 95 near mile marker 184 and south of Pollock on the Nez Perce-Clearwater and Payette National Forests, was reported at 12:02 p.m. today. Traffic control measures are in place by the Idaho County Sheriff’s Office along Highway 95 for public and firefighter safety. Please avoid the area if possible and do not stop along the roadway. Travelers may experience limited visibility due to smoke in the canyon corridor. There are multiple aviation, engine and ground resources from the Nez Perce–Clearwater and Payette National Forests, Idaho Department of Lands, and local rural fire departments on scene with additional resources enroute. The fire is currently estimated at 300+ acres and is actively burning in timber and grass. Mike Almas’ Northern Rockies Type 2 Incident Management Team has been ordered and will be briefed tomorrow at 2:00 p.m.
As additional information becomes available, it will be posted to InciWeb at https://inciweb.nwcg.gov/incident/5999/ .